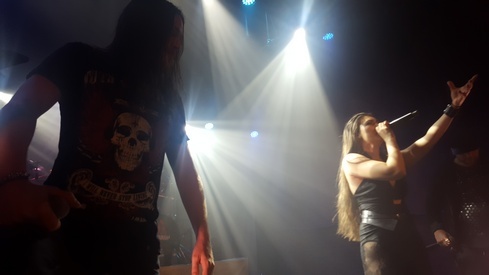 When it comes to doing show reviews, I have a tendency to cut to the chase and dive in, but when I go “Amaranthe-ing” (verb: to hit a string of Amaranthe tour dates) it seems like that would merely skim the surface of the experience. Amaranthe shows have held a special spot in this scribe’s metallic heart after their last North American tour run here in 2015. Long story short, after dealing with some serious personal turmoil and becoming a bit removed from everything for a few months, catching three Amaranthe shows in a week (Connecticut, Pittsburgh, and Cleveland – then an 8 hour drive back home) was just the experience necessary to flip the switch and get things to start moving back in the right direction. There’s probably a number of people, as fans of heavy music, that can relate – one really great show can, in fact, leave a lifetime of memories…and I got three. So there much anticipation for their first US run in support of their fourth album, Maximalism. Though it may be needless to say, the band delivered just as powerful an experience as the last run. With the often unpredictable NYC traffic (at least for one who lives 90 minutes away), it’s often best to plan ahead and avoid rush hour if possible, so arriving at 3PM for 6PM doors isn’t as crazy a notion as it sounds. Accomplishing a few errands and an early interview with Elize Ryd (posting soon) made the time go by quickly, and it should be noted that there were some die-hard fans standing in line at least 2 hours before doors to ensure a quality vantage point – the band is really beginning to gain a foothold here in the states. Starting off the night was Sweden’s Smash into Pieces. 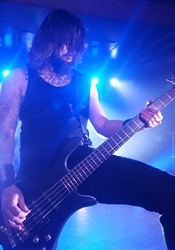 A hard rock band whose own Chris Adam Hedman Sörbye has been “stepping in for Jake” for a few Amaranthe runs at this point since their last US run in 2015. 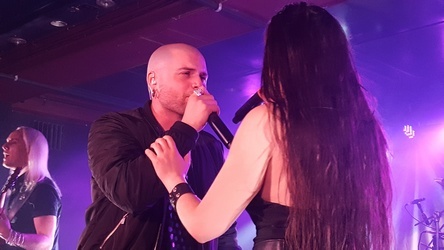 So this meant he has been pulling double duty with Smash into Pieces as well as Amaranthe (which he also did previously in Europe last year) – no easy feat for a vocalist. But he and his band meant to introduce themselves to North American audiences in the best way possible. Pulling out all the stops, the band impressed visually with a small video monitor, the Apocalpyse DJ himself (their drummer, who dons a light-up logo mask and black robe), and lighting that illuminated the band’s logo on several band members faces throughout the show. But that aside, the band sounded significantly heavier in the live setting than on disc, and it was made clear quickly that they had plenty of charisma to spare. Plenty of movement and smiles on stage went a long way, as did their amusing “hypnotizing” merch pitch, with Adam telling fans that they “will buy merch” while the monitor displayed a hypnotic visual. They played a short set, focusing mostly on the recently released Rise and Shine, though adding in “Disaster Highway” to end the night. Next up was the London-based Cypher16, who carried with them a unique sound. Seemingly part metallic, part rock, and then some – they didn’t necessarily bounce around the stage as much as Smash into Pieces but they more than held their own. Bassist Carl Dawkins worked over and incited the crowd on numerous occasions, while swinging his bass around frenetically. 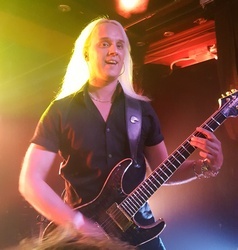 Singer/guitarist Jack Doolan keeps his voice melodic, despite some notably heavier tunes in the set (such as “Before the Reign” or “The Whole Sea to Cross”), and gives the band a more interesting approach than if they just played it straight. Some slight progressive tendencies and interesting solo-work rounded things out as they continued to warm-up the crowd for the main event. As Failure/Anthem had some bus issues that prevented them from playing this evening, Detroit’s Citizen Zero would play directly before Amaranthe. An interesting tour choice, as the band’s grunge-y, groovy rock mix may not have been the most extreme of the bunch, but the young act (their debut, State of Mind, released last year) was all about entertaining the crowd. Cuts like “State of Mind,” “What a Feeling,” and “Lure and Persuade” featured some high-octane rock action that easily won over the audience. Vocalist/guitarist Josh LeMay certainly has the charisma to take the band to the next level, between his melodic vocals and banter between songs. They also played a more mellow track, “Home,” that provided some additional depth to the act (which wasn’t played at the other two venues later on). Some ample proof that sometimes a more diverse bill isn’t such a bad thing after all. With the crowd fully prepped and ready, it was time for Amaranthe to hit the stage. A new Maximalism-based intro provided the backdrop as the band hit the stage and blasted into two new songs, “Maximize” and “Boomerang.” The band continues to impress with their stage presence, as a few tours with Chris Adam has allowed him to be fully integrated into the band. Playing a total of six tracks from the new album, it’s also clear that these tracks were designed for the stage. 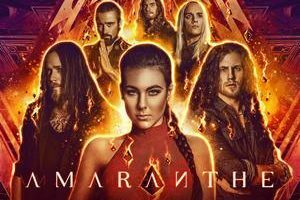 The immediate interaction between band members (lots of smiles going on) in the first two tracks solidified that Amaranthe want to deliver a memorable performance and continue to improve in this arena…even if it was already a strong point. As it’s been noted in previous show reviews, Amaranthe divide and conquer through utilizing the talents of the entire squad. Vocalists Elize Ryd, Henrik Wilhelmsson, and Chris Adam all play off of each other, moving to the front when the attention is fixed on them while providing additional interaction while allowing others to be the focal point. There’s always something intriguing to watch, and near-constant movement and crowd engagement. Elize got her moment in the spotlight with the ballad “Endlessly,” where due to a close vantage point, the touching song seems to have just as much of an impact on the vocalist as it does the crowd, based on the look in her eyes singing the track with nothing less than genuine emotion and charisma. Growler Henrik got his turn to shine with “Fury,” one of the band’s heavier tracks to date and a sure-fire way to get the crowd moving between softer cuts like “True” and the afore-mentioned “Endlessly.” The lighting itself being a source of entertainment moving between Henrik’s red backdrop to blues/greens at varying moments. Then between Olof Mörck’s tasteful solos where he always moves front and center, drummer Morten Løwe Sørensen’s entertaining drum solo, and bassist Johan Andreassen’s usual pre-encore crowd interactions (always focused on whatever the crowd happens to shout at him), everyone has something memorable to do during the set. Reliable live mainstays such as “Amaranthine,” “Drop Dead Cynical,” “Call Out My Name,” “Invincible,” and “The Nexus” all found their way into the representative 18-song set (with much attention given to the band’s ever-growing back catalogue). 90-minutes finishes all too quickly when the band is on-stage, but it never seems to really be the end of the night. Not too long after finishing their encore, most of the band was already out and about with those who didn’t exit after the performance – happy to mingle and chat with fans. A relatively early conclusion only seemed to mean that the band spent more time interacting with the public – going to the point where club staff informed everyone that it was time to close doors at 12:30, well over an hour after the band finished their performance…and undoubtedly a reason why Amaranthe fans are so genuinely invested into the band – the band is genuinely interested in not just performing for them, but actually engaging with them on a personal level. 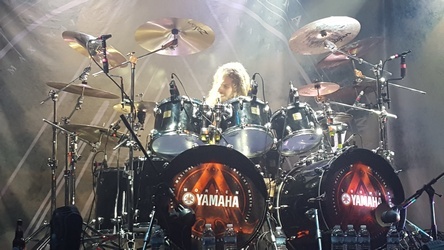 After a day of rest (outside of working of course), it was time for round two of the Amaranthe tour – not even the snow earlier in the day, and continued sporadic snow squalls/showers, could dampen the spirits of those who made their way to the band’s Friday night performance. Never having been to a show in this part of NJ before, let alone Asbury Park, House of Independents was a pretty nice venue. Clean surroundings (and bathrooms – wow! ), good sound, and some nice design made for an inviting atmosphere to partake in. Though I’m guessing in nicer weather it’s more problematic to find nearby parking being so close to the shore, but with a recent bout of snow, parking one block away wasn’t too shabby. With some solid timing with a relatively stress free drive into New Jersey (taking only slightly longer than a trip to NYC) – the most surprisingly thing about entering the venue just as Smash into Pieces hit the stage was the notably small crowd in attendance at that point in the night (perhaps somewhat due to the miserable weather earlier in the day). It was to be their loss, as Smash into Pieces performed with the same level of intensity and passion as they had two nights prior, not caring about the size of the crowd so much as showing everyone there what they were made of by playing just as energetically as they had done to a much larger crowd previously. This band certainly deserves another North American trek in which to play a few more songs. Cypher16 continued with the same level of enthusiasm, charging through their set as the crowd began to slightly grow in size. Next up, Citizen Zero seemed to have at least a portion of the crowd invested in checking them out specifically, and encouraged the crowd by noting that they had played one of their first shows (nationally?) at the venue the year prior. With no transportation issues today, South Carolina rockers Failure/Anthem took the stage tonight as the crowd continued to grow (though by best estimates it was somewhere between only 100 and 150 people at its best). Definitely the furthest away from the usual DR coverage spectrum of the openers, it was clear to see that the band was an energetic bunch, as they focused on tracks from their debut album, First World Problems, which was released last year. A significantly younger-faced vocalist (compared to the rest of the band anyways) seemed to make more sense once guitarist Kile Odell explained that they had lost their vocalist and he (Johnny Rose of More to Monroe) was filling in for them on this tour. Unfortunately some sound issues, at least near the front of the stage, seemed to make it hard to hear him at times but it didn’t seem to slow them down. Odell did most of the chatter between tracks, and expressed some sincere gratitude for the band’s first single, “Paralyzed,” having seen some chart success before the band closed their set. 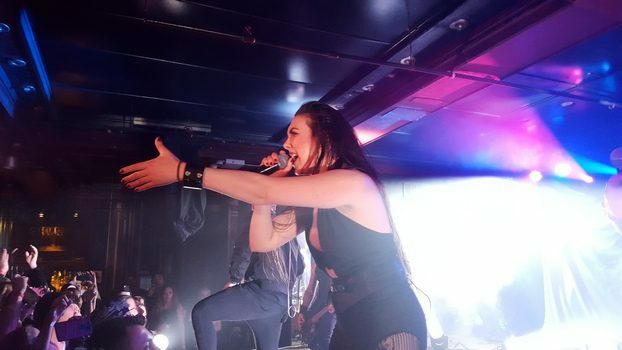 Certainly the most intimate experience I’ve seen with Amaranthe to date, in regards to crowd size – the band still pulled no punches when it came to their on-stage presence and energy. A band’s reaction to a smaller gig is often a good indication of their strength and sincerity as a band, so consider Amaranthe at the top of their game for what they did here in Asbury Park. If anything, it was just as impressive as in NYC, maybe even more so at times due to the intimacy with the crowd. To focus on a few songs that weren’t mentioned already, “On the Rocks,” one of the bouncier songs from Maximalism, seems the most tailor-made for the live show, with the band getting the crowd involved with sing-a-long efforts (“Na na na na-na…”) and clapping, alongside of the love-it-or-hate-it charm of “That Song.” For what it’s worth, “That Song” fits right in with the band’s live approach, with the driving Queen-esque beat having a more thunderous appeal behind it, while the lighter vibe allows the band more opportunity to charm the audience. While some may have been taken aback with its release last year, give it a chance in the live setting and see for yourself. Newer tracks also seem to give Elize Ryd more wiggle room to improvise some vocal work, which truly shines in the live setting (as she has notably done with “Dynamite” and “Unreal” in the past), as does her sheer enthusiasm, charm, and on-stage athleticism (those high kicks are impressive). Her end of the show growling “no” stint (for it being the end of the show, of course) was one of the more amusing parts of each night. 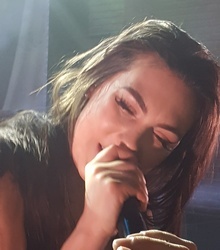 It’s a credit to efforts of the rest of the band that she hasn’t stolen the show – it can’t be stated enough that everyone in the band has their place in Amaranthe. Their antics show an ease and enjoyment of working with each other – probably a reason why finding a permanent replacement for Jake E is such a daunting task. Initially meant to be a two-show investment this time around, some events favorably turned the tables and I made my way to Reverb for the second time ever (the first being Rivers of Nihil’s release party for Monarchy), this time with my two boys (Connor, age 7, and Devin, age 5) in the back seat. Prepping them for the three hour journey with light snacks and some pleading/begging with them to take a nap on the way, fingers were certainly crossed that they’d pull through the night without feeling miserable. Not that it was the first show for either of them, as Connor has accompanied me to now 4 shows in the past year, and Devin made it out to see Soilwork last fall (though he admittedly crashed before the band hit the stage). So plans were made to get there fashionably late, even if it unfortunately meant missing the final gig for Smash into Pieces and Cypher16, in hopes they’d last to the end of the show without being overly exhausted. Arriving just before Citizen Zero made their way to the stage, it seemed the timing couldn’t have been better, as some significant changes were made to their set. 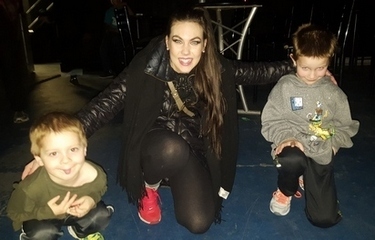 They were joined onstage by a youngster (also named Conner) who impressively helped them sing “State of Mind.” The other treat came in the form of the band performing a cover of Kiss’ “Detroit Rock City,” with none other than Elize Ryd herself on the stage to help sing. Without question the song went over rather well (especially considering the apparent 1 hour prep time) with the crowd and it was nice to see the comradery between the bands on the tour resulting in something special like this. Failure Anthem made their last trek to the stage next, and benefitted by a better sound mix this evening, particularly vocally, which made the set a significantly stronger one from a personal perspective – while playing into the crowd knowing that this would be the last gig of the tour. With two young ones accompanying me, and Reverb’s set up with couches and seats on the sides, it made for a different view of Amaranthe’s set that I’ve gotten used to (that being right in the front and in the middle of everything) and a more objective view of everything that goes on in their show. The vibe was found to be just as infectious despite being further removed from the act, viewing the last-show crowd feeding off the energy of the act – arms pumping, hands clapping, bodies jumping/dancing, and mouths shouting along to each track – not to mention watching my two guys soak everything in, with my oldest grooving and clapping as he watched atop a couch and my youngest getting a huge grin to accompany the opening riff to “Drop Dead Cynical” (his favorite track – a lasting, proud dad moment for sure). Speaking of which, the support acts all joined Amaranthe to finish off “Drop Dead Cynical,” providing a stage full of smiles and energy that gave a memorable impression of the fun they had along the way, despite the grueling nature of a full North American tour that provided few breaks along the way. 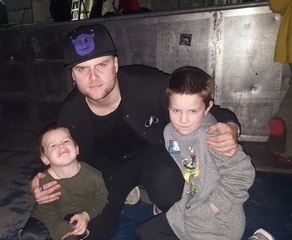 During Johan’s encore banter (from which my children’s ears may be forever scarred) he invited everyone to stick around after the set and hang out with the bands to celebrate the end of the tour. So a good chunk of the crowd obliged, with members from each of the bands happily greeting and engaging with the audience – yet another testament to the easy-going and supportive feel of the tour…and Amaranthe’s apparent view that touring is a family affair, and that everyone’s invited to be a part of that family. This is a band that works hard, but they make it seem so easy on stage. They are on the verge of truly breaking through the US market, and no band deserves it more. Perhaps one more tour will get them there. Bring it on! And as for my two little troopers, both successfully made it through the night and had a blast, even managing to keep it together for a little while after the show ended for a few hellos. No doubt one step closer in solidifying their involvement as metal fans of the next generation.